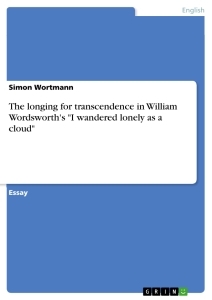 The longing for transcendence in William Wordsworth's "I wandered lonely as a cloud"
When reading the poem “I wandered lonely as a cloud” by William Wordsworth for the first time one might find it hard to come up with any explanation for the speaker’s highly emotional response to an ordinary nature scene. The goal of this essay is therefore to interpret this piece of literature as regards the meaning of nature. Under this premise the thesis evolved that Wordsworth presents a poet’s longing for transcendence. Introducing the thesis, firstly a definition of the term transcendence is given for clarification. Moreover, several examples of transcendental images in shape of sublime nature are being pointed out in order to verify the existence of transcendence in this poem. Having done that, the speaker’s longing for a transcendental experience is going to be shown by the emotional way he describes his sensations. To illustrate the speaker’s emotional bond to nature, his description of the daffodils is being analyzed. Interpreting the poem, special attention is given to language i.e. the use of stylistic devices and their function. Towards the end, the structure of the poem, the relation between form and content, and the metrical and rhythmical patterns are going to be examined. Transcendence describes the process of going beyond normal or physical human experience into a spiritual area. Wordsworth employed a vast amount of transcendental imagery in his poem using the image of the sublime. More specifically speaking, the sublime is being represented by infinite nature, which is considered “[…] fundamental to sublime experience ”. One example for the vastness of the natural scene is sketched in with the nouns “vales and hills” together with the adverb “high” in line two. Following the description of the daffodils in line three to six the reader gets confronted with the image of a plant that seems to be omnipresent, a “crowd” (l.3) or “host” (l.4) that emerges at many different places like “Beside the lake” (l.5) or “Beneath the trees”(l.5). As another illustration how infinite and hence sublime the whole scene appears, Wordsworth introduces the cosmic dimension with the noun “stars” (l.7). The fact that the high number of “Ten thousand” falls at the beginning of line eleven yet again lays the focus on the unimaginable scale of nature. Moreover, the use of the adjective “continuous” (l.7) as well as “never- ending” (l.9) reinforces the image of infinity. Theresa M. Kelly, Wordsworth’s revisionary aesthetics: (Cambridge: Cambridge University Press, 2010) 102. An essay on William Wordsworth's poem " I wandered lonely as a cloud"
Dorothy Wordsworth and her influence on the life and work of William Wordsworth with particular emphasis on the "Grasmere Journal 1800-1803"
The Concept of "Nature" in William Wordsworth's "The Tables Turned"
Form and Meaning of Wordsworth’s "Composed upon Westminster Bridge, September 3, 1802"
The Aching Joys of the Romantic Genius: The Loss and Transcendence of Unmediated Experience in Wordsworth’s "Tintern Abbey" and Goethe’s "The Eagle and the Dove"